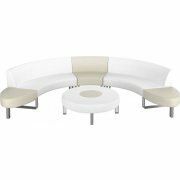 Hip Hop Reception Furniture moves to your rhythm. This unique modular collection from Lacasse offers flexible and inviting arrangement solutions to transform any waiting room or lounge area. Cool contours and elegant profiles will give your office a distinct professional appeal that exudes innovation and originality. 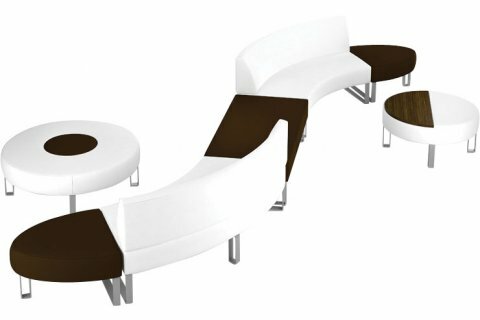 Modular reception seating harmonizes with your space, seamlessly integrating with décor and other office furniture for a smooth layout. However you choose to arrange your reception seating, you want to be sure that it will keep your guests comfortable for many years to come. Sturdy wooden frames, powder-coated steel legs and metal-to-metal connectors ensure that your reception furniture will stay put until you are ready to create a new configuration. Renew the energy of your surroundings with the elegant fluidity and contrast of the Hip Hop Collection. Flexible Layouts: Offers complete modularity, including back-to-back arrangements. Strong Connections: Individual pieces are attached via metal-to-metal connecting devices. Durable Frame: Frame is constructed from plywood and hardwood. Sturdy Legs: Powder-coated steel legs offer sturdy support. Abundant Options: Call to select your custom combination of upholstery and finish hues.